So, what are the critical challenges to executing a global social media strategy? According to Becky Carroll, they include language translation, time zone differences, and varying global trends. Success in your home market certainly does not guarantee success in international markets. In fact, a highly successful social media campaign in your home country may translate very poorly overseas. You should therefore tailor your approach accordingly. “It’s not easy, but get it right and you can reach and engage a whole new audience that may not otherwise have discovered your brand” (Our Social Times). With a detailed understanding of your target market, an appreciation of cultural norms and a smart strategy, you can establish a thriving global presence on social media. In this article, you’ll learn how to develop a winning global social media strategy. I’ll share plenty of actionable tactics for optimizing your campaigns locally and draw upon concrete examples from real companies. Social media preferences, uses and platforms can differ substantially between countries. Doing some background research is therefore an important first step in developing a social media strategy. Let’s consider some of the crucial factors that you need to take into account. Identify the most popular social media networks in your target country. Facebook is the most dominant social network globally and its popularity is growing. The maps from Vincenzo Cosenza shows how Facebook’s dominance has spread from 2009 until 2016, where it is the most popular social network in 129 out of the 137 countries analyzed. Whilst Facebook dominates in the Americas and Europe, local social networks dominate in many Asian countries. So before implementing a social media campaign in any international market, consider which are the dominant networks in that country (the map below provides a handy overview). 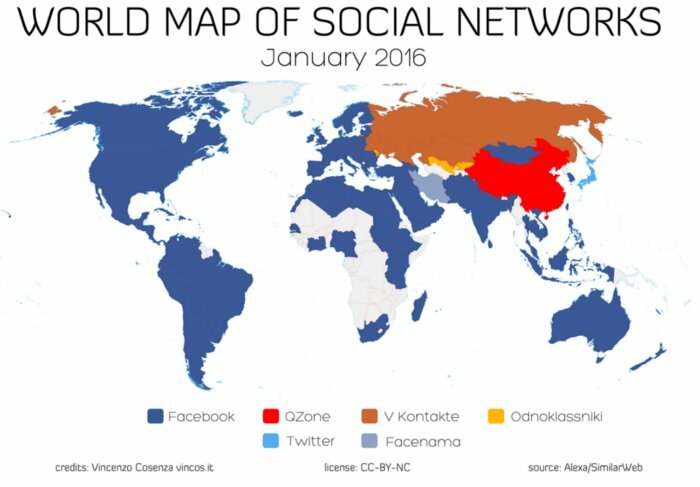 For example, Qzone is the biggest network in China and VKontakte dominates in Russia (We Are Social). Whilst the major social media networks dominate the global social media landscape, local social networks rule in many Asian countries. Investigate government censorship and bans that could impact your social media campaigns. Are there local laws or regulations around products, advertising or promotions? In China, there is a list of banned keywords which could see your content being blocked. It is also important to check if there are any bans on your chosen social network in that country. Turkey enforces periodic bans on social media based upon the current political environment; for example, the country blocked Twitter in March 2014 in the face of government corruption scandals. Although various countries have social media bans in place, such bans are often periodic and users can usually use VPNs to access blocked websites (Business Insider). Acquire a deep understanding of your target market, including the demographics, language and culture. Also consider specific behaviors and motivations of the target market you are trying to reach. Young affluent teens in the city will have different social media habits from lower income elderly in rural areas. Twitter is more popular with young people in urban areas, and Pinterest has a predominantly female user base (Pew Research). Within China, Qzone is popular with teens, Renren for university students, and Kaixin001 is primarily used by office workers (Convince and Convert). Understand how people use social media platforms in your target market. Guesswork in using homegrown platforms is the easiest way to commit a huge blunder. Assess what type of content people are sharing and how often, then adapt your approach to fit in. Using social media to express opinions about politics, community issues and religion is very common in the Arab world. In China, India and Mexico, sharing views about music and movies is the most popular activity (Pew Research). Given that free downloads of music and movies as well as online games are popular in China, a campaign linked to free downloads would work well in that country. Consider how people access social media networks. Research if people primarily use mobile or desktop to access social media, and consider how your content can be optimized accordingly. Accessing social media through smart phones is especially common in Mexico, yet few use mobiles to gather product information (Pew Research). This helps explain the success of the ice bucket challenge in Mexico and other countries where accessing social media via mobile is popular. Assess what type of content performs best in your target market. Whilst useful and entertaining content performs best in Europe and the United States, online gaming and music sharing are the most popular social networks in India (Convince and Convert). Given that Mexicans, Americans and Spanish are the most likely to regularly use their phones to take a picture or video, a social media campaign based on user generated video content would probably work well in those countries (Pew Research). Consider the success of the “Crash the Superbowl” campaign in the US (Contently). Focused research should help you get to grips with the broader global context and super-local trends crucial to formulating a smart social media strategy. Before implementing your social media strategy, set clear objectives at the outset: Is your key goal to raise brand awareness, warm up prospects, or something else? What key geographical markets do you want to reach? Once you know what you want to achieve, you need to organize a tactical plan to realize it and take action at the local level. Let’s consider what you need to know for successful implementation. Consider having multiple social media accounts on the major social networks in your key target markets. Coca Cola operates numerous Twitter accounts which enable the brand to successfully communicate with its international audiences at the local level. Coca Cola Indonesia and Coca Cola France feature different conversations and discussion topics based on customer interests in the respective countries. Clearly understanding the target audience and paying attention to local subtleties enables Coca Cola to gain more authentic customer engagement (Rocket Post). Comparing the messaging of the Coca-Cola France and the Coca-Cola Indonesia Twitter accounts. Ensure your messaging is culturally sensitive. You need to be careful to avoid words and gestures considered unacceptable overseas as well as be well acquainted with the present social and political climate (Rocket Post). Language and cultural blunders are easy to commit and are very common. For example, to congratulate the U.S. on winning Ghana in the World Cup, Delta tweeted two images: the Statue of Liberty to represent the U.S. and a giraffe to represent Ghana. Given the photo was actually a stock image of a giraffe in Kenya and giraffes are not even native to Ghana, it is not surprising the campaign was poorly received (Entrepreneur). Use authentic messaging that is relevant to your target audience. “Your message needs to resonate with your audience, so assigning in-country managers of your social media is essential” (Becky Carroll, the University of California). By hiring in-country social media managers, you will ensure your messaging is more authentic by using local lingo and cultural references. It is therefore worthwhile considering the option of using locally-based managers for the entire production and distribution of content as well as interaction with followers. However, if an in-country manager is not feasible, you should at the very least partner with a language service provider that can offer translation and copywriting services. Even within the English-speaking world, adapting your messaging to the local audience helps ensure that your campaign will be better received. If an American brand were targeting a British audience, it would be wise to take into account differences over spelling, measurement systems, currencies, and more basic cultural factors such as sense of humor. Optimize your social media marketing for the time-zone of your target market. Most people access social media during the morning and evening commute to work and at lunchtime. Check whether these trends hold in your target market and on the social media platform you are using. An in-country social media manager will be more able to optimize timing and increase your responsiveness on social media. Your target market may be most active outside your waking hours, meaning you would be missing out on key monitoring opportunities and potential to react quickly to trends. An in-country manager can immediately interact with a prospect that engages with your content. Use location-based marketing. If you are targeting a particular district or city, it is worth considering how you can personalize your messages to people based on their location. After all, every country has distinct regions that share specific customs, personality traits, and interests. There are often striking differences between north and south of a country or between city and rural areas. Whilst McDonald’s opened vegetarian restaurants at two of the most visited holy sites in India, it still offers a half-vegetarian menu in regions that do not follow the same strict religious customs. The McDonald’s India Facebook page features images and messages displaying products to attract both vegetarian and non-vegetarian customers (Rocket Post). The low investment cost required for social media means even small businesses with limited budgets can leverage social media for global reach. As internet access and use of social media continues to accelerate worldwide, the opportunity of capitalizing on global social media strategy can only expand. 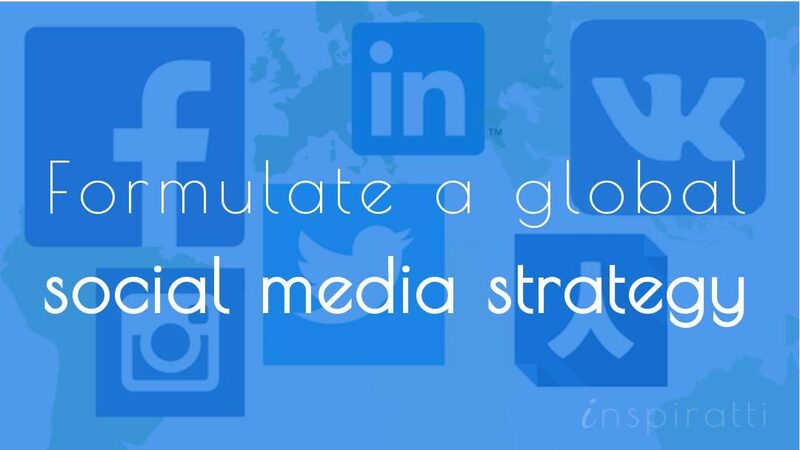 By executing a strategic global social media strategy, you can raise awareness of your brand and build a loyal following and customer base across international markets. “You have to speak to people at the right time and the right place in their language, both literally and figuratively”. Are you using social media to reach an international audience? Have you launched a successful global social media strategy? Do you think adaptation is always critical? Share your thoughts in the comments.